t*rexes and tiaras: My thrifty gift swap.. Although it rather seems like a while ago now, I signed up before Christmas to take part in Janet's Thrifty Christmas Gift Swap. She runs it every year in the run up to the festive period and I enjoy thinking up a suitable selection of gifts for my recipient. The idea behind this one is that things are supposed to be either thrifted or homemade, which adds a little more of a challenge, but rather appeals to my bargain-hunting ways. 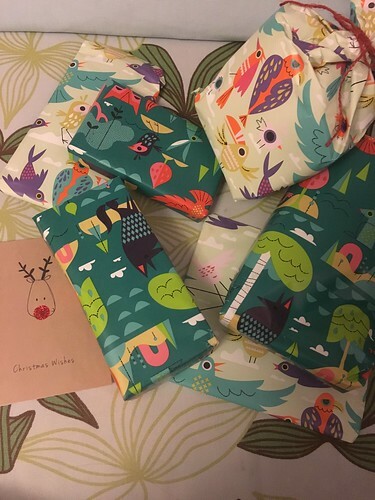 This year, because my recipient was based in the US, I was in a bit of a hurry to try and make sure it reached her before Xmas and I completely failed to take any photos. Thankfully I have had a message from her to say that she loved the parcel. But here are some photos of the contents of the parcel I was lucky enough to receive from Louisa. A new mug, which might be destined for my office because my previous work mug was a heat-sensitive one and the transfer design has been peeling off lately. 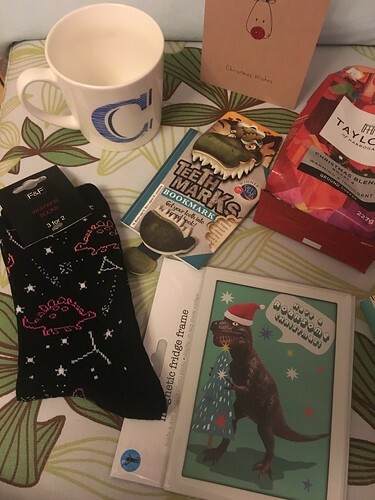 Dinosaur themed socks, chocolates and a bookmark which fits over your book to eat the page, which is awesome. Also coffee and a letter-set and a rather great magnetic photo frame, which gave me the push I needed to clear out the front of the fridge, getting rid of the old post-it notes and shopping lists and put a photo of a recent trip with my sisters on there instead. All in all, I think Louisa has me pretty well sussed! Did you take part in any gift swaps this Christmas? I didn't do any gift swaps again because of moving but I always love seeing what everyone else got! 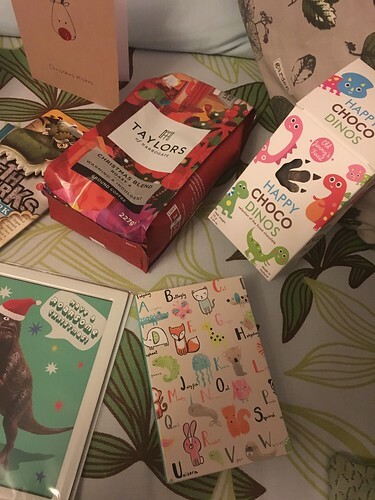 You received some super pressies!